You gotta love early-season college hoops. The Texas Southern Tigers are 2-4 on the season, but their two wins have been mighty impressive. In their season opener, Texas Southern took down Baylor in Waco as a 20.5-point underdog. And on Monday night, the Tigers shocked No. 18 Oregon with an 89-84 win in Eugene. Oregon was favored by 25 points. This is even with Texas Southern trailing by 13 points with 16 minutes to go in the second half. And with 7’2″ freshman star Bol Bol going off for 32 points — 13-22 FG, 4-6 3PT — and 11 rebounds for Oregon. So with that information, it’s especially amazing that Texas Southern won this game, and by five points. 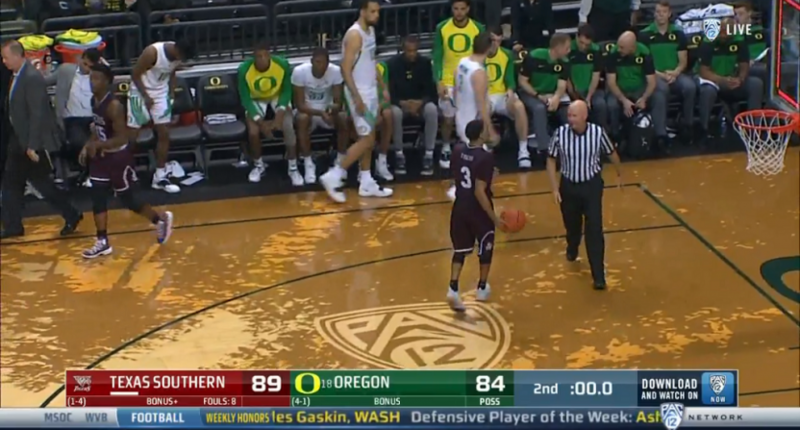 Texas Southern outscored Oregon 57-45 in the second half to pull off the shocking win. Early-season college basketball can bring some wacky results, and it will be hard to get wackier than this one. It’s a game that will obviously knock Oregon out of the top 25 and could look ugly to the tournament committee come March.